Firewall must have HTTP as trusted or firewall turned off. OTRS requires a properly configured & running Apache web-server & back-end database. The basic install of RHEL-6 included an Apache install with no database. Steps are provided below to do a basic configuration of Apache & MySQL. Verify that Apache (httpd) is installed by using the below command. Confirm that httpd is under installed packages. You can use a group command to install MySQL group or select individual packages. MySQL should be ready for OTRS. You can install all dependencies at once using one yum command. 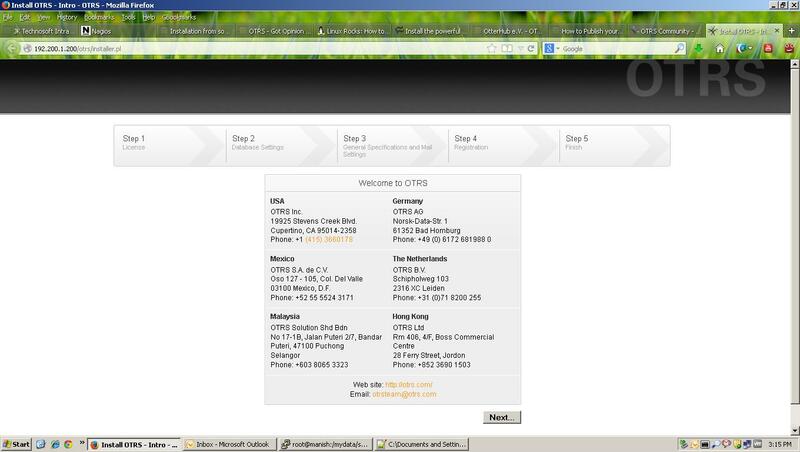 If the test succeeded it will prompt to create a new user for otrs. 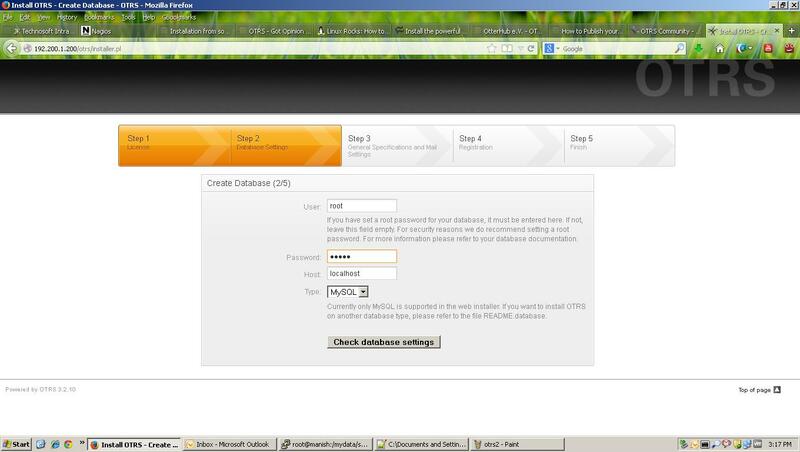 Give name and password for the new user and click next. On the next screen provide the system related details like fqdn of the machine,email of the admin, company name etc as shown below. * If you don’t have any dns server ready then select no in check_mx record box. 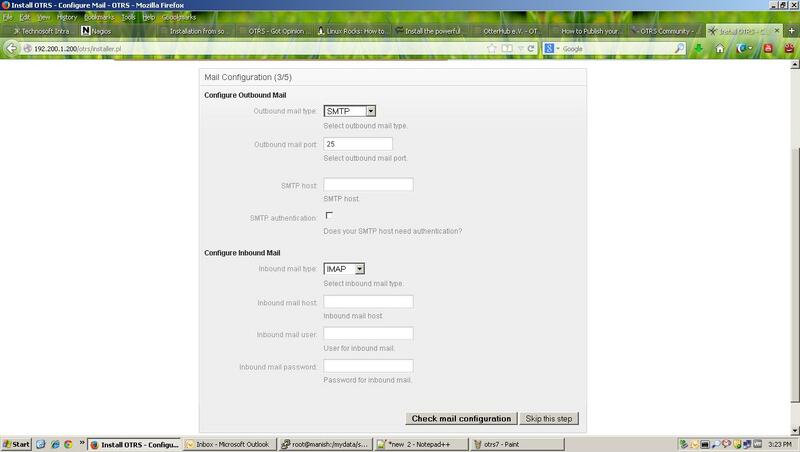 On the next screen provide your email server settings. Provide your information and complete the registration process. 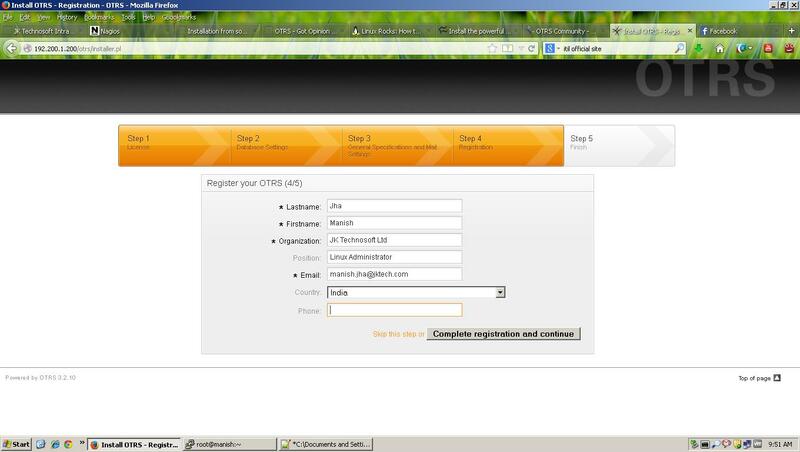 After registration is complete you will get a final page showing you the username/password required to login onto otrs web console. With this otrs installation is completed. 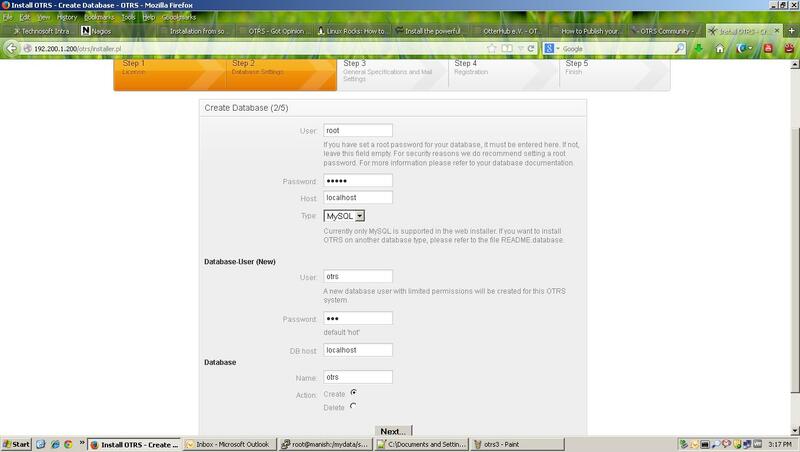 I just tried to install OTRS on my system RHEL 6 , But its not working fine . 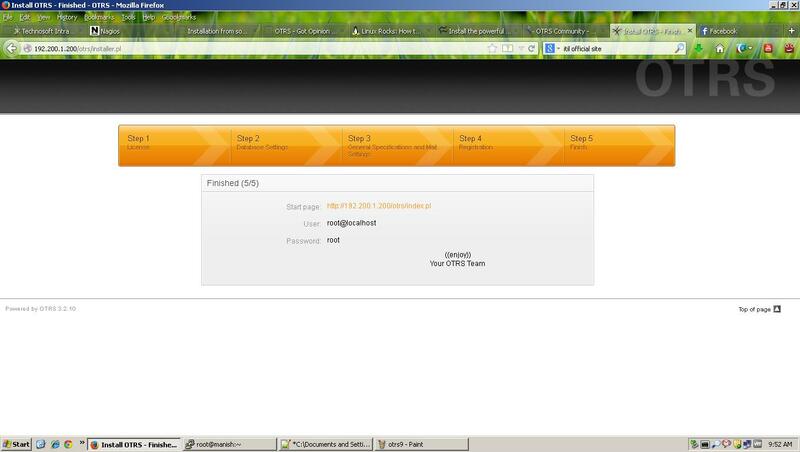 I have just tried to OTRS (3-3.8) on RHEL 6 . I have also installed some modules (But some are not installed like GD etc….). I have notice all services running fine (MYSQLD,OTRS and HTTPD). But when i tried to open otrs in firefox using “http://yourhost/otrs/index.pl” am getting a page cannot be find/displayed error . Is that mandatory that all modules should be installed . o GD::Text…………………..FAILED! Not all prerequisites for this module correctly installed. o GD::Graph………………….FAILED! Not all prerequisites for this module correctly installed. Starting httpd: [Tue Dec 30 17:20:51 2014] [warn] The ScriptAlias directive in /etc/httpd/conf.d/zzz_otrs.conf at line 5 will probably never match because it overlaps an earlier ScriptAlias. [Tue Dec 30 17:20:51 2014] [warn] The Alias directive in /etc/httpd/conf.d/zzz_otrs.conf at line 6 will probably never match because it overlaps an earlier Alias. 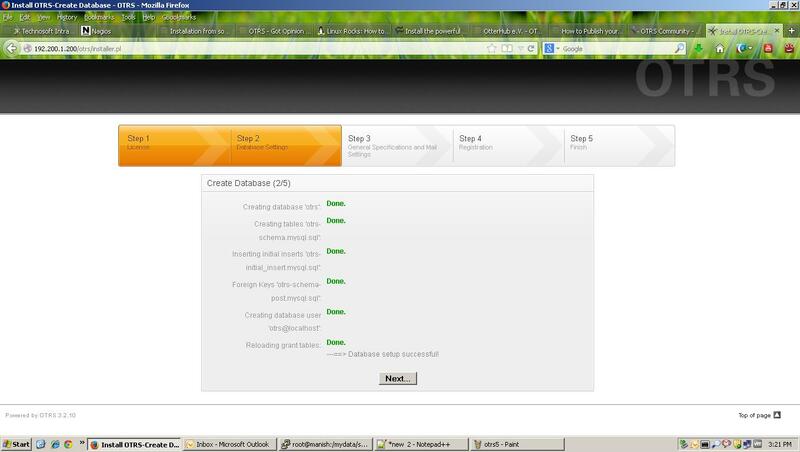 Yes it is necessary to load all the modules then only you will be able to see OTRS configuration page. When all the modules are present then from configuration page itself you have to do a lot of configuration and some additional components are installed from that page only.Oracle DB module you can skip but GD needs to pe present in system. Please kindly let me know from wr i can get modules . Am getting error while trying to install modules through CPAN . Please find my configuration details . Hi Finally i have installed the GD module also . 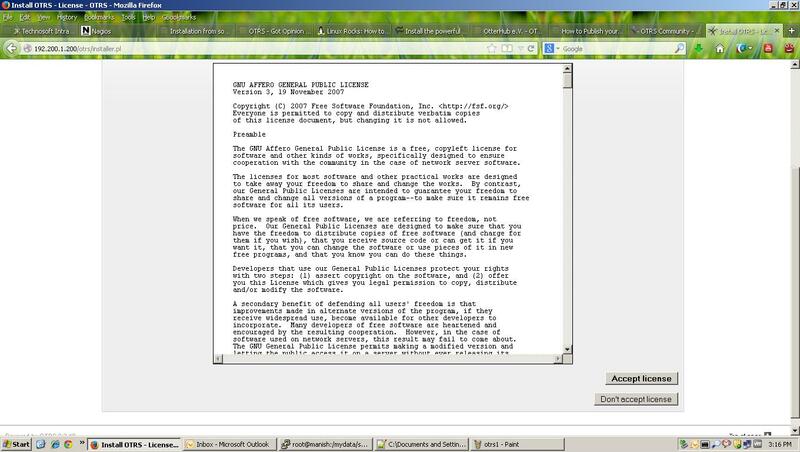 But still i couldn’t get on webpage by using “http://localhost/otrs/installer.pl”. Please help me guys !!!! How can i install through webpage . I have followed the above doc . Please kindly help me dude !!! Please find the below config details . SElinux is disabled (But didnt reboot system). 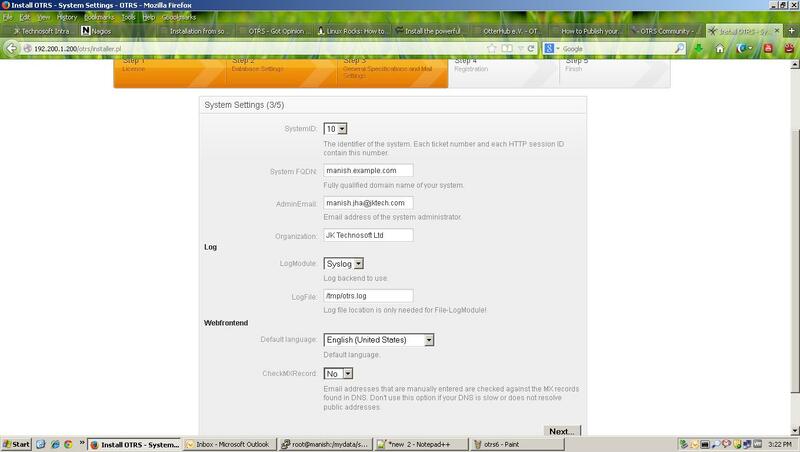 I have installed , When i try on webpage to open “https:localhost/opt/index.html) am getting below error . The server at *.*.*. (IP) is taking too long to respond.